While the Un-ited States is Mexico’s largest su-pplier of natural gas and continues to be agrowing market for additional U.S. natural gas exports, at the same time, Mexico is the fourth supplier of crude to the United States by volume, generating revenue of over $11.6 billion during 2014 from the sale of 230 million barrels of crude. It is a dynamic largely defined by Mexico’s vital relationship with Houston, Texas. In 2014, the trade accounts between these two areas reached $192 million, a figure that is expected to dramatically increase following the implementation of a 230km pipeline that will carry natural gas from the U.S. to Mexico. The pipeline is expected to carry 1.4 billion cubic feet of gas into the country each day, and is expected to be completed in 2017. In parallel, Mexico’s Centro Nacional de Control de Energía, (National Centre of Energy Control, CENACE) is already in conversation with many US companies to promote a project that interconnects Nogales, Sonora in Mexico and Tucson, Arizona, but its aspirations for the Mexican energy sector extends far beyond US borders. Following a December 2014 Memorandum of Understanding among the United States, Canada and Mexico, the three countries have created an institutional framework for consultation and sharing publicly available materials to improve energy information and the energy outlook for North America. The project’s current areas of focus include comparing, validating, and improving respective energy import and export information, sharing publicly available geospatial information related to energy infrastructure, and exchange on views and information regarding projections of cross-border energy flows, and a harmonization of the terminology, concepts, and definitions of energy products. Hosted at nacei.org, the project provides public information on trade statistics, static and interactive maps, results of a trilateral energy outlook project that applied common assumptions within the modeling frameworks used by each country, and a cross reference for energy terminology in Spanish, English, and French. In order to reconcile trade data discrepancies, Canada, Mexico and the United States also plan to convene working groups to validate trade statistics for liquid fuels, natural gas, and electricity. The working groups will continue validation of geographic information system (GIS) data and will expand energy infrastructure maps to include additional elements and functionality. Mexico is the fourth-largest oil producer in the Americas after the United States, Canada and Brazil, and an important partner in the U.S. energy trade. 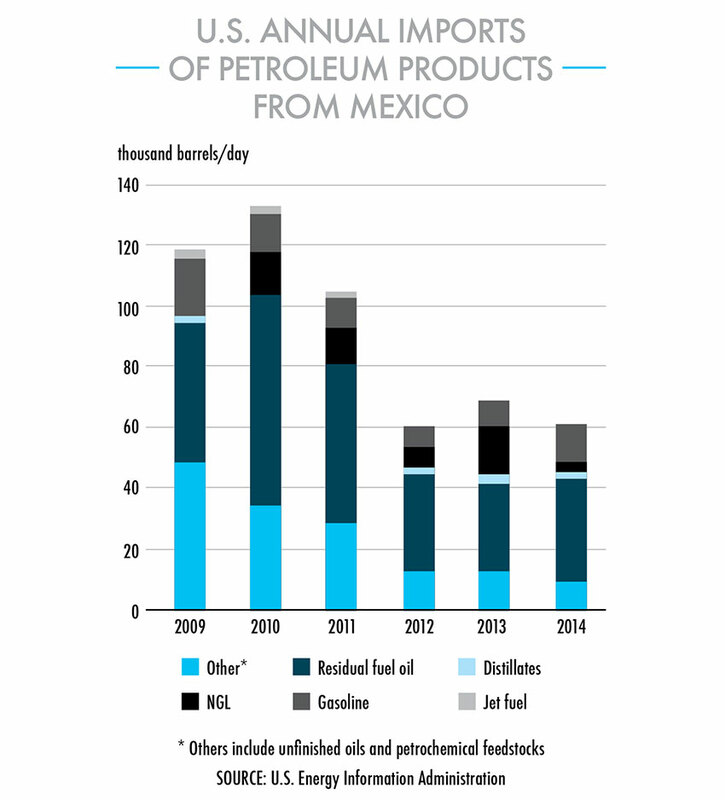 From a domestic perspective, oil is also a crucial component of Mexico’s economy. In 2014, the sector generated 11% of the country’s export earnings, however, since the rate of total production has been in decline over the past several years, in December 2014 the Mexican government enacted significant constitutional reforms that among other things, ended the 77-year monopoly of Petróleos Mexicanos (PEMEX), the state-owned oil company. As of 2015, Mexico’s federal budget was based on Mexican crude oil being valued at $79 per barrel, although Mexican Maya crude oil averaged less than $50 per barrel through the first seven months of 2015. Declines in oil production have a direct impact on the country’s economic output and on the government’s fiscal health, given earnings from the oil industry – including taxes and direct payments from companies like PEMEX – represent one-third of total government spending. To counterbalance this price decline, refined petroleum product consumption in Mexico needs growth. At present, petroleum and natural gas represent the greatest percentages of Mexico’s energy consumption, at 45% and 40%, respectively, although natural gas is increasingly replacing oil in electric power generation. This is important to consider because although Mexico has considerable natural gas resources, its production is modest relative to other North American countries. Consumption of natural gas is expected to increase by 64% between 2013 and 2027, but the development of shale gas resources is proceeding slowly and as a result, Mexico remains a net importer of natural gas, with most imports arriving via pipeline from the United States. As domestic production stagnates and demand increases – particularly in the electricity sector – Mexico will likely have to rely on increased pipeline imports of natural gas from the United States and liquefied natural gas (LNG) from other countries. Mexico’s relationship with Houston, Texas, is particularly important. In 2014, the trade accounts between these two areas reached $192 million, a figure that is expected to dramatically increase following the implementation of a 230km pipeline that will carry natural gas from the U.S. to Mexico. To meet increasing electricity demand, Mexico is also constructing dozens of new natural gas-fired power plants across the country. To fuel these new plants, natural gas pipelines are being constructed in a bid to import larger amounts of natural gas from the United States. Between 2010 and 2014 alone, Mexico’s imports of natural gas from the U.S. increased by 120%, and account for nearly half of total U.S. natural gas imports. Still, given its current pipeline constraints, Mexico is forced to meet some of its natural gas demand with the more expensive LNG, though this demand is expected to peak soon and fall by almost half by the end of 2016, as cheaper natural gas becomes more available. In terms of electricity, the trade relationship between the US and Mexico dates back as far as 1905, when privately-owned utilities on either side of the border helped supplement demand with a few low-voltage lines. Since then, both Mexico and the United States have developed highly regulated electricity sectors, thereby limiting international interaction. Still, Mexico has been a modest exporter of electricity to the United States since 2003. In 2013, Mexico exported 7.8 million kilowatt hours to the United States, or 11% of total electricity imports. Following the issuance of a presidential permit for the construction of a transmission line across the U.S-Mexico border by the U.S Department of Energy, electricity sales from Mexico to the U.S. look set to increase. When completed, the transmission line will supply electricity from a Mexican wind farm to the Californian market. Beyond the United States, however, Mexico is working to become a bridge connecting energy markets in North America, Latin America and Asia, and also exports smaller amounts of electricity to Belize and Guatemala.